The far, far lesser known Irish stereotyping. Some snakes just came from good, down-to-earth Catholic families, but because they have to crawl around on their stomachs, they just get swept up with all the other snakes and get uprooted from their homeland. 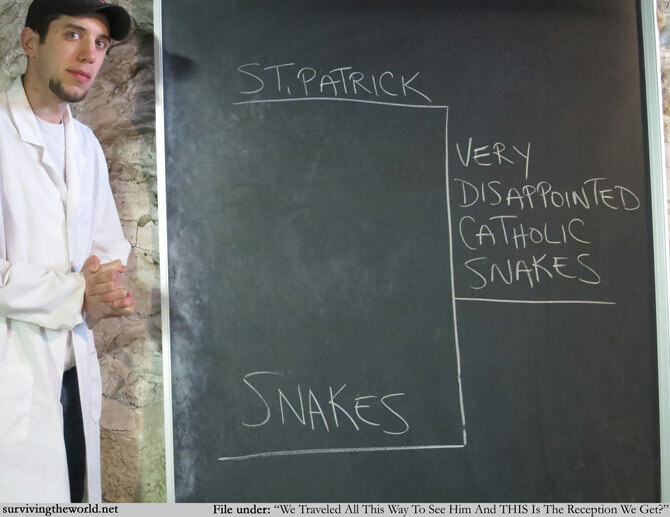 And then St. Patrick, ignoring the pleas of the few snakes holding rosaries in his mouth, went back home and had a Guinness. Alas. No Irish snake eyes were smiling that day, and some far less than others. Anyway, bracket week is back - how in hell are we up to the sixth week of these things - and as a reminder, it's not who beats who, it's what is the outcome if something goes up against something else. You can go back and go through some of the past brackets weeks if you like: I, II, III, IV, and V.
By the way, if you would like to participate in the STW NCAA bracket pool, you can enter through Thursday. No prizes, just the opportunity to take me to school. EMERALD CITY COMIC CON: Come see me in Seattle! March 28-30!